Tucked away from bustling Tel Aviv on quiet, picturesque Tshernichowski Street, Hotel Saul opened its doors just two months ago but has already succeeded to provide its guests with a unique hospitality experience, integrating the best of boutique hotel atmosphere with services usually reserved for large hotels and chains. 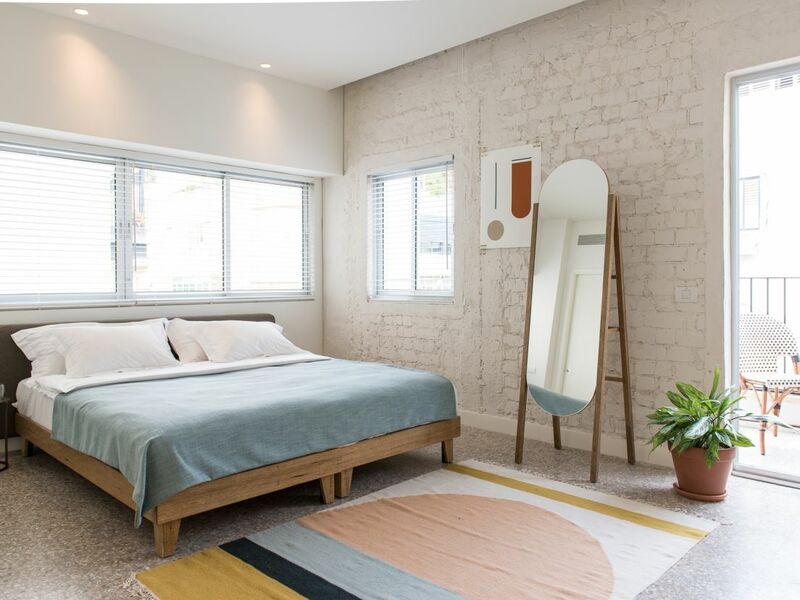 The hotel offers an up-close and personal urban experience with local flare and comforts, thanks to its carefully designed rooms, stellar staff and ideal location in Tel Aviv’s vibrant center. Hotel Saul truly has the best of Tel Aviv at its doorstep - bright Mediterranean beaches, the Carmel Market, Habima Square, Rothschild Boulevard, Nachlat Binyamin, and eclectic nightlife scene are all a short stroll away. Saul’s 34 guest rooms feature high ceilings and a sleek, modern design from which guests can enjoy the Mediterranean air and stunning city views. The rooms’ decor integrates steel and exposed concrete with warm, walnut furnishings, restored street lamps and hand-woven Turkish linens. Together, these design elements mirror the mix of urbanism, modern luxury and warmth of Tel Aviv. And whether you’re on a business trip or traveling with family, Hotel Saul has the ideal room for you. From compact “shoe-box” rooms to spacious “deluxe balcony” rooms, to “family” rooms with shared hallways, the hotel’s staff will ensure your accommodations fit your needs. Want to enjoy the city’s hustle and bustle by day but sleep undisrupted at night? Not to worry, all of Hotel Saul’s guest rooms have been acoustically engineered to ensure optimal sleeping conditions. Hotel Saul is much more than a place to hang your hat after a long day of touring in Tel Aviv. Rooms are equipped with WiFi and Apple TV. Guests can relax in bed with free Netflix and a theatre-style bucket of freshly popped popcorn sent hot to your room, or opt for something a bit livelier with the hotel’s wide variety of games that can be enjoyed in the rooms or in cheerful common spaces. Hotel Saul delights all the senses. Guests are invited to open their day at the hotel’s gourmet sandwicherie, Barvazi, which is headed by Chef Raz Rahav, Gault & Millau’s Best Chef in Israel, 2018 - a sumptuous way to start off a day of sightseeing, sunbathing, shopping and clubbing! At Hotel Saul, providing guests with superior, round-the-clock hospitality is a top priority. The hotel’s management prides itself in recruiting only the warmest hospitality specialists who share our dedication to making Saul feel like home to every visitor. While the hotel’s location in the heart of Tel Aviv and comprehensive services in a boutique hotel setting are the first aspects that attract guests, it is the hotel’s impeccable hospitality that sets Saul apart and makes its guests’ stay in Tel Aviv truly memorable. In the coming months, guests will be able to unwind and socialize in Saul’s “Work & Fun” space, a sprawling fourth-floor terrace furnished with comfortable couches, work tables and a variety of games. In addition, a custom vending machine will be installed in the hotel, from which guests can purchase unconventional items such as sunscreen, slippers and trendy snacks. And soon, the hotel will be opening its rooftop sun terrace - the ideal spot for guests to take in the Tel Aviv skyline, work on their tan, or curl up with a good book. Whether you’re lounging in Hotel Saul’s comfy, living-room style lobby, or hitting any one of the city’s many tourist, historical or recreational attractions, the hotel wants you to experience the true essence of Tel Aviv. Having opened just two months ago, the hotel continues to offer an appealing introductory rate for bookings in the coming months. This promotion aims to provide guests with the best possible value, allowing you to make the most of your vacation by offering extreme comfort and warmth from the focal point of this dynamic, non-stop city. For more information visit http://hotelsaul.com/.